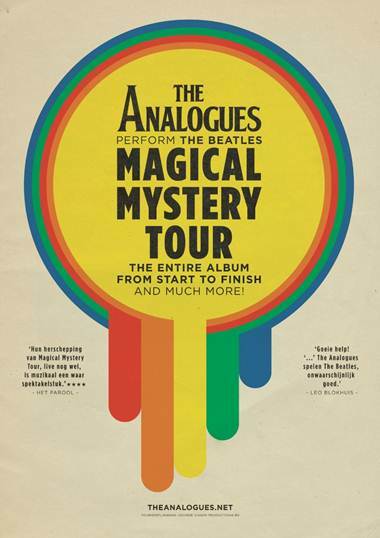 By equal parts a musical showpiece and a creative sonic experiment, The Analogues take their name from their dedication to recreating the complex and layered sound of The Beatles’ Magical Mystery Tour, playing the same instruments that the Fab Four used to record the album at Abbey Road Studios. Sidestepping all digital effects, songs such as Strawberry Fields Forever, Across the Universe and All You Need is Love, as well as other gems from the band’s catalogue, are supported by beautiful vintage instruments and managed by as many technicians as musicians on stage recreating music which The Beatles themselves never performed live. After developing this extraordinary show by playing some of the largest theatres in the Netherlands, The Analogues premiered their performance at the Norfolk & Norwich Festival in May that ‘fairly rocked the Theatre Royal’ (epd24.co.uk – full review can be found here), before playing London in July. Click here for a taste of their live show. If you ever wondered how Magical Mystery Tour would have sounded live, this is the closest you’ll ever get. I live in Holland and have been to this show of The Analogues twice. We will go for a third time next month simply because they are that good! Absolute must see for every Beatles fan. Great! Gives mee feever, And next year St Pepper!!!! I heard Sir Paul is coming!!!! The link doesn't do them justice. If you see them in a theatre with everything set up to relive the full experience, you will be blown away. I was last night, at least.